Michael Ellis was born in 1961 and in a resident of Charleston SC. After living in Atlanta GA. for over 25 years now. 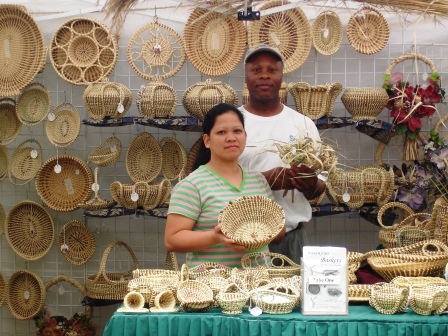 He and his wife Jovelyn started their own business sewing and selling sweetgrass baskets from their home. Now for the third year he and his wife goes to some of the many well known arts and craft shows in and around the South East. 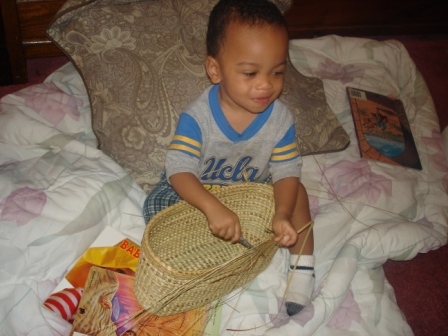 Michael was taught how to make baskets from his mother at the age of Seven. Jovelyn is another story! she was born in the Philippines we have only been married for eleven years now. She learn how to sew sweet grass baskets from my mother and whats so?unique about her baskets is she have her own distinct designs just as I do. basket making have only been past down from mother to daughters in the family but never to outsiders in the past. But now is taught to extended family members. Going out to collect and harvest the raw materials for his Grandmother and mother as he was growing up, then moving to Atlanta Ga?to study at one of its Techincal school.? Although he was always still with his heritage he never abandoned the art, even after moving there. I just kind of put it on hold but not completely. I didn't sew any basket at the time. But I would go out and collect the raw material for my mother every chance I got during school breaks. Michael's ancestors who were slaves from West Africa who bought this traditional art form which have been pass down from generations to generation in his family. Now I have my own family now fourth generation I now can see that at lease one of my little one's little Michael Junior is taking interest in the art already he is only 22 months old. And I can say even if he does not stick with it at lease he will know how to carry it on. They is a old saying in Charleston! come a day, their will sew! ''their will'', time will come? their will sew'' hey look at me.